Modeling and simulation expert James Kersey has joined the Czero team as a technical project lead and analyst specializing in hydraulics, fuel injection systems, powertrains, and high-pressure liquid systems. James has applied his expertise to projects ranging from vehicle crash analysis to military technology for landmine detection. During his Master’s program in aerospace engineering at the University of Illinois at Urbana-Champaign, James used Computational Fluid Dynamics (CFD) to study flow phenomena and develop algorithms for simulating multiphase flows for the United States Air Force. He joins Czero from Dassault Systemes, where he worked as senior industry process consultant for large international companies in automotive, aerospace, and consumer products manufacturing. In that hybrid business/technical role, he helped large and cross-functional engineering departments implement and improve processes for seamlessly integrating system components developed by different teams. Prior to Dassault, he worked for Gamma Technologies, maker of GT Power, as an application engineer for hydraulics and fuel injection and as a product manager for an integrated simulation environment. Excited to return to a more hands-on role in engineering innovation, James has joined Czero’s lean, tightly integrated team as a technical project lead. He hit the ground running with a big innovation project in the oil and gas industry that Czero kicked off in January. The opportunity to do proof-of-concept work developing market-driven products with a positive environmental impact attracted James to Czero. Czero’s Fort Collins location in the foothills of the Rocky Mountains was another big factor for James, who has a long-standing passion for technical mountaineering. His interest was sparked during his college days by a trip to Mount Shasta, in Northern California, and he has since climbed the 14,000-foot peak three times. Mount Whitney, in the Sierra Nevadas, is next on his list. 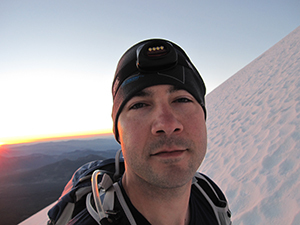 The technical challenge–and spectacular scenery–of glaciated peaks holds special appeal for James, who is also planning trips to Mount Rainier and Mount Adams, where he first learned mountaineering.